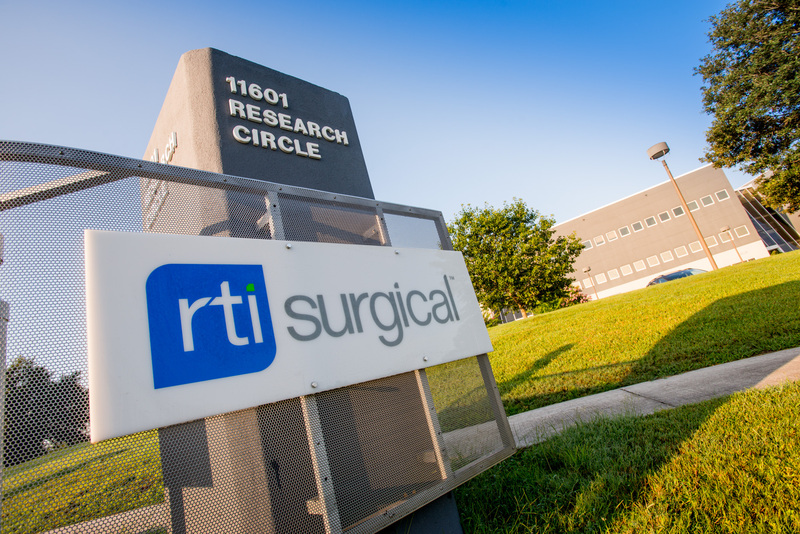 RTI Sends Letter to Stockholders Continuing to Urge Them to Vote the White Proxy Card for its Highly Qualified Nominees - RTI Surgical Holdings, Inc.
ALACHUA, Fla. (May 19, 2016) – RTI Surgical Inc. (“RTI” or “the Company”) (Nasdaq: RTIX), a global surgical implant company, today sent a letter to its stockholders urging them to protect their investment in RTI by voting the WHITE proxy card FOR the election of Peter F. Gearen, Brian K. Hutchison, Thomas A. McEachin, Jonathon M. Singer, Paul G. Thomas, Nicholas J. Valeriani and Shirley A. Weis, RTI’s highly qualified director nominees, at the Company’s upcoming annual meeting of stockholders on May 26, 2016. Messrs. Gearen, Hutchison, and McEachin and Ms. Weis are existing directors. The leading independent proxy advisory firms Institutional Shareholder Services (“ISS”) and Egan-Jones Proxy Services (“Egan-Jones”) recommend that stockholders vote the WHITE proxy card FOR all seven of RTI’s highly qualified director nominees. The support of ISS and Egan-Jones reinforces the Company’s belief that it has the right strategy and team to increase sustainable stockholder value. RTI has been taking important strategic steps to position the Company for long-term growth, including transitioning to a majority of sales through a direct model and executing mergers and acquisitions that the Company believes have accelerated its strategy and transformed its business. RTI believes that its 2015 financial results demonstrate that its strategy continues to gain traction: on a year-over year basis, revenues grew 7.4% (9% on a constant currency basis), adjusted EBITDA* grew 36.4%, and adjusted net income* per fully diluted common share grew 109%. RTI has continually refreshed its board with a goal of ensuring strong leadership that can enhance the creation of long-term stockholder value. RTI’s independent nominating and governance committee unanimously determined that the Company’s nominees are the better candidates to join the board, following a thorough evaluation of more than 20 potential director candidates, including those proposed by the dissident stockholder. RTI Surgical’s (“RTI” or “the Company”) annual meeting of stockholders takes place in less than one week. We urge you to vote FOR the election of RTI’s highly qualified nominees: Peter F. Gearen; Brian K. Hutchison; Thomas A. McEachin; Jonathon M. Singer; Paul G. Thomas; Nicholas J. Valeriani and Shirley A. Weis. Messrs. Gearen, Hutchison, and McEachin and Ms. Weis are existing directors. We believe these seven highly qualified nominees have the right experience, backgrounds and qualifications to effectively increase long-term value for ALL RTI stockholders. The leading independent proxy advisory firms Institutional Shareholder Services (“ISS”) and Egan-Jones Proxy Services (“Egan-Jones”) recommend that stockholders vote the WHITE proxy card FOR all seven of RTI’s highly qualified director nominees. The support of ISS and Egan-Jones reinforces our belief that we have the right strategy and the right team to increase sustainable stockholder value. We have outlined and are executing a strategy that we believe will enable RTI to become a $500-million-revenue company by growing revenue faster than the market, with gross margins approaching 60% and operating margins approaching 20% of total revenues, and enhance long-term stockholder value. To achieve our long-term goal, we are transitioning to a majority of sales through a direct model, because we believe direct sales have more growth potential, higher gross margins and greater predictability than commercial sales. Since we launched our direct sales force in 2005, we have grown direct sales faster than the market, with a compound annual growth rate of 29% between 2005 and 2015. Direct sales have grown from approximately 40% of revenues in 2011 to approximately 50% of revenues in 2015, and we expect to grow direct sales to approximately 60% of revenues in the long-term. Drive growth in our focused products: map3® cellular allogeneic bone graft, nanOss® advanced bone graft substitute and U.S. direct surgical specialties. In the first quarter of 2016, revenue for this portfolio grew 48% year-over-year. Add strategically to direct distribution. We believe that targeted investments in our largest direct business, our direct spine business (44% of our first quarter 2016 direct revenue), drove a 17% year-over-year increase in revenues in this business in the first quarter of 2016. Innovate and launch new products. In 2015 we launched 16 new products or line extensions and so far in 2016, we have introduced three new spine products that we believe are important growth drivers, and signed an exclusive U.S. licensing agreement with Oxford Performance Materials. We are also expecting the first human implantation of our long-term bovine project in mid-2016, a product that could revolutionize treatment for ligament reconstruction. Increase our international footprint. We have expanded our distribution to nearly 50 countries worldwide, and year-over-year we increased our international direct sales 18% in the first quarter of 2016. In addition, we have successfully executed mergers and acquisitions that we believe have transformed our business, accelerated the execution of our strategy, and positioned us for long-term growth. The successful acquisition and integration of Tutogen Medical in 2008 and Pioneer Surgical Technology in 2013 has enabled the shift to a larger direct sales model, broadened our portfolio, added faster-growing products, added new tissue applications to maximize the gift of donation, expanded tissue bank and organ procurement organization relationships, and contributed to stronger financial performance. We believe that our 2015 financial results demonstrate that our strategy continues to gain traction: on a year-over year basis, revenues grew 7.4% (9% on a constant currency basis), adjusted EBITDA* grew 36.4%, and adjusted net income* per fully diluted common share grew 109%. As our business has transitioned to a direct model and the industry and regulatory landscape has evolved, we have refreshed our board in an attempt to ensure we have the right directors to increase stockholder value. If our slate of nominees is elected at the upcoming meeting of stockholders, seven of nine directors will have served in their positions for three years or less. As part of this continuous board refreshment, our independent nominating and governance committee conducted a thorough evaluation of more than 20 potential director candidates, including those proposed by dissident stockholder, Krensavage Partners, LP (“Krensavage”). The committee unanimously determined that our proposed nominees are the better candidates to help us execute our strategic plan and enhance value for our stockholders. The RTI slate provides CEO experience at an orthopedic and medical device company, public company CFO and big four accounting firm experience, public company board experience, orthopedic surgeon experience to ensure the customer voice is represented, and provider and payor experience. Election of the Company’s slate will result in a board with eight independent directors out of nine, including two directors associated with the investor with the largest economic stake in the Company (Water Street Healthcare Partners). RTI’s board nominees are committed to continuing on the path to enhanced value creation for all stockholders. We urge you to protect your investment and vote the WHITE proxy card FOR the election of RTI’s highly qualified nominees: Peter F. Gearen; Brian K. Hutchison; Thomas A. McEachin; Jonathon M. Singer; Paul G. Thomas; Nicholas J. Valeriani and Shirley A. Weis. It is critical that you vote the enclosed WHITE proxy card TODAY to protect your investment, and disregard any green proxy cards that you might receive from Krensavage. Stockholders who have previously submitted proxy votes in favor of the dissident's nominees or withholding votes from the dissident’s nominees can change their votes to favor RTI’s nominees by submitting the WHITE proxy card. Only the latest-dated, validly executed proxy card counts. 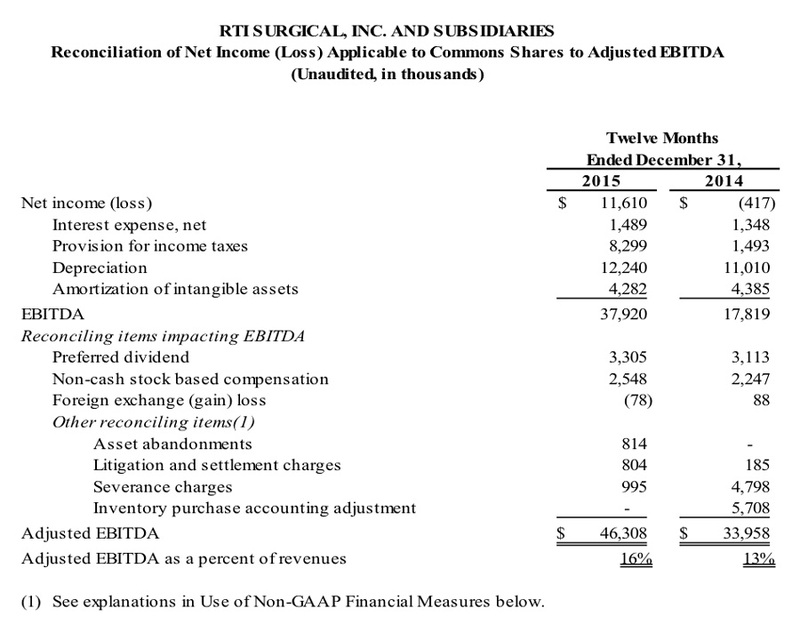 RTI Surgical has filed a definitive proxy statement with the U.S. Securities and Exchange Commission (“SEC”) in connection with the solicitation of proxies for its 2016 annual meeting of shareholders. Shareholders are strongly advised to read RTI’s 2016 proxy statement and the accompanying WHITE proxy card and other documents filed with the SEC when they become available because they will contain important information. Shareholders can obtain copies of RTI’s 2016 proxy statement, any amendments or supplements to the proxy statement and other relevant solicitation materials filed by RTI with the SEC in connection with its 2016 annual meeting of shareholders free of charge at the SEC’s website at www.sec.gov, on the company’s website at www.rtix.com, or by writing to our Corporate Secretary at our principal office at 11621 Research Circle, Alachua, Florida 32615. RTI, its directors, and its executive officers may be deemed participants in the solicitation of proxies from shareholders in connection with its 2016 annual meeting of shareholders. Information concerning persons who may be considered participants in the solicitation of RTI’s shareholders under the rules of the SEC is set forth in public filings filed by RTI with the SEC and in the definitive proxy statement relating to its 2016 annual meeting of shareholders. This communication contains forward-looking statements within the meaning of the Private Securities Litigation Reform Act of 1995, including those statements regarding the further strengthening of our board when RTI's new director candidates are elected, our strategic plans to grow, expand margins and increase long-term value for all RTI stockholders, our financial goals, our progress towards executing our strategy, our expected growth in direct sales and our expected new products. These forward-looking statements are based on management’s current expectations, estimates and projections about our industry, our management’s beliefs and certain assumptions made by our management. Words such as “anticipates,” “expects,” “intends,” “plans,” “believes,” “seeks,” “estimates,” variations of such words and similar expressions are intended to identify such forward-looking statements. In addition, except for historical information, any statements made in this communication about anticipated financial results, growth rates, new product introductions, future operational improvements and results or regulatory actions or approvals or changes to agreements with distributors also are forward-looking statements. These statements are not guarantees of future performance and are subject to risks and uncertainties, including the risks described in public filings with the SEC. Our actual results may differ materially from the anticipated results reflected in these forward-looking statements. Copies of the company’s SEC filings may be obtained by contacting the company or the SEC or by visiting RTI’s website at www.rtix.com or the SEC’s website at http://www.sec.gov. This letter includes adjusted EBITDA and adjusted net income per share, non-GAAP financial measures that exclude certain amounts. These non-GAAP financial measures are not in accordance with, or an alternative for, generally accepted accounting principles in the United States. A reconciliation of the non-GAAP financial measures to the corresponding GAAP measure is included in the table below. Adjusted EBITDA and adjusted net income per share should not be considered in isolation, or as a replacement for GAAP measures. 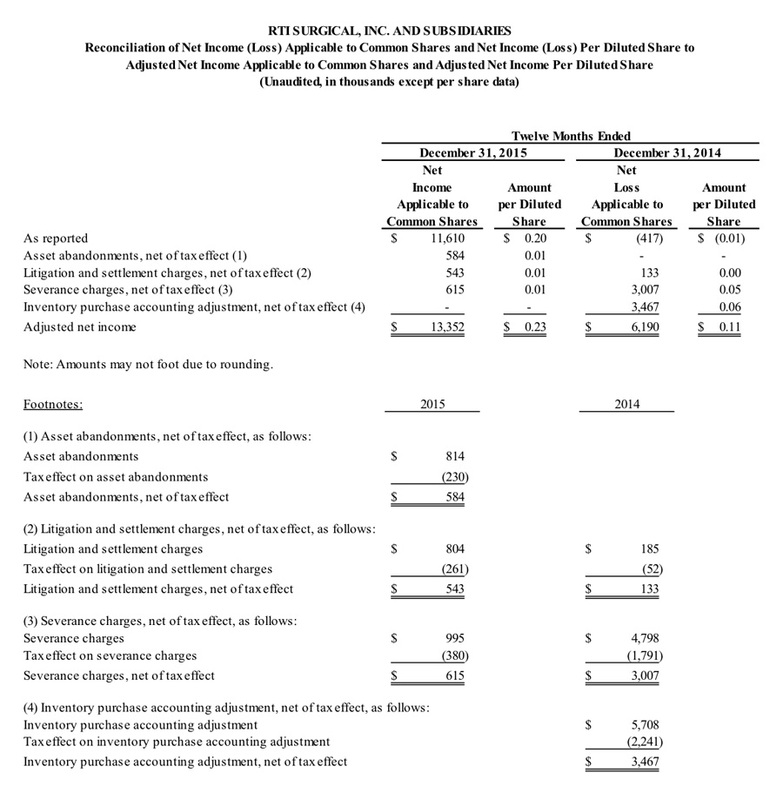 The Company believes that presenting adjusted EBITDA and adjusted net income per share in addition to the related GAAP measures provide investors greater transparency to the information used by management in its financial decision-making. The Company further believes that providing this information better enables the Company’s investors to understand the Company’s overall core performance and to evaluate the methodology used by management to assess and measure such performance. (1) 2015 Asset abandonments – This adjustment represents an abandonment of certain long-term assets at our German facility. Management removes the amount of these costs from our operating results to supplement a comparison to the Company’s past operating performance. (2) 2015 and 2014 Litigation and settlement charges – This adjustment represent charges relating to settlements of domestic and international distributor disputes. Management removes the amount of these costs from our operating results to supplement a comparison to the Company’s past operating performance. (3) 2015 and 2014 Severance charges – This adjustment represents charges relating to the termination of former employees. Management removes the amount of these costs from our operating results to supplement a comparison to the Company’s past operating performance. (4) 2014 Inventory purchase accounting adjustment – This adjustment represents the purchase price effects on the sale of inventory acquired in the Pioneer Surgical Technologies, Inc. acquisition in 2013, which have been included in costs of processing and distribution. Management removes the amount of these costs from our operating results to supplement a comparison to the Company’s past operating performance.